Yesterday Lewisham’s recycling rate was cited on the Guardian Environment Blog so I thought it would be appropriate to provide a response on our own blog (which was also mentioned). The first issue that needs raising is that the blog posting appears to favour incineration as a means of waste disposal, referencing Germany as an example of good practice. The blog then describes Lewisham’s recycling rate as miserable and poses the question “Do you actually like landfill tips, Lewisham?”. The latest comparable data (2008/9) shows that Lewisham has the 4th lowest rate of municipal waste sent to landfill in the country and an even lower rate for household waste at 3.72% (although this figure is now a couple of years old it is unlikely that it will have changed significantly). The majority of waste in Lewisham is incinerated, and that waste is turned into electricity which is in turn fed into the national grid. So the answer would be no we don’t like landfill tips. Secondly I would like to address the issue of our recycling rate of 16.8%, firstly this is a low recycling rate when compared to other Local Authorities nationally, however it is slightly unfair to be comparing the recycling rates in Lewisham with those in Staffordshire Moorlands (62%). The inner city demographics of Lewisham provide additional challenges in terms of sustainable waste management, including differing housing stocks, lack of and size of gardens and storage as well as a higher proportion of hard to engage groups with transient populations. It would perhaps be fairer to compare recycling rates in Lewisham with other London Local Authorities, where again at first sight Lewisham appears to be under performing. However if the figures are looked at in a bit more depth the situation is a more favourable. Looking at the first six months of 2009/10 data for dry recycling (excluding garden and food waste collection) shows that Lewisham is ranked the 7th best performer in terms of dry recycling collection at the kerbside across London. Why do we believe looking at the dry recycling rate is more relevant than the overall recycling rate? – In Lewisham we believe that our recycling collection (and therefore rate) should be viewed in the broader context of the impact on the environment and carbon reduction measures. The reason for many local authorities high recycling rates is the provision of food and garden waste collections, which by weight contribute significantly to the overall recycling rate (approximately 1/3 of your average household bin is organic waste – in Lewisham this is closer to 40%). We have previously laid out the reasons for not collecting food or garden waste on this blog, but it essentially boils down to the fact that it would be neither environmentally nor economically beneficial and would achieve nothing more than to artificially inflate our recycling rate. We prefer to encourage residents to reduce waste in the first instance and compost waste at home (especially food and garden waste) rather than give it to us to recycle/compost. We take the view this is a much more environmentally sound policy.Other local authorities who choose to provide food and garden waste collections and therefore boast much higher recycling/composting rates usually have very high overall waste per household figures, due to these collections. These authorities also have different drivers such as Landfill tax, so the monetary pressures heavily influence their decisions. In Lewisham we take sustainable waste management very seriously, we focus on waste minimisation as well as recycling by promoting the Love Food Hate Waste programme, Home Composting through composting workshops and offering free compost bins (last summer we ran 18 compost workshops and gave away 1,700 free compost bins), as well as running campaigns around real nappies, reusing shopping bags, not buying bottled water and stopping junk mail which all help in reducing waste in the waste stream. We believe the way in which we currently manage our waste is both responsible and sustainable. Categories: Uncategorized, waste minimisation | Tags: composting, food waste, garden waste, junk mail sticker, love food hate waste, mail preference service, real nappies, Recycling, waste minimisation, waste strategy | Permalink. We have created some “no junk mail” stickers which you can fit on your letter box, these should stop things like Pizza menu’s and taxi cards. Pick up your FREE JUNK MAIL STICKER by visiting your local library. 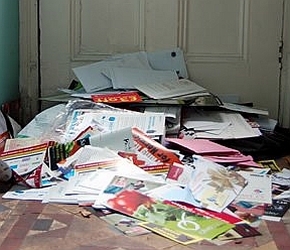 You can also visit www.stopjunkmail.org.uk for hints and tips. Categories: Junk Mail, waste minimisation | Tags: junk mail, junk mail sticker, mail preference service, pizza menus, waste minimisation | Permalink.